So this is my latest squash book... I think I have become obsessed.. they are so cute! I just Love them! 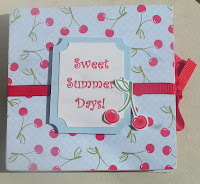 This one is made using the summer picnic paper from the occassions mini. I think the biggest reason I love this paper is because it matches so perfectly with the tart and tany stamp set. Thats what I love about Stampin Up! everything coordinates so it takes the guess work out. Anyways... I used real red, Bashful Blue, and Only Orange cardstock to coordinate. This is what the book looks like when it is opened up... you would put your pictures/journaling etc.. So I have finished quite a few of these books actually for various people as gifts and always wished I had a small box to fit them in. So then it dawned on me! Why dont I just make a box?! So thats what I did. I used bashful blue for the box then just simply wrapped some real red ribbon around it. I then used my scallop punch with Wild Wasabi and my 1 3/8 circle punch to punch out the cherry. I attatched them together and there ya have it! Very simple. Though when I was done I decided that on the next one I make I might do a simple background of some sort on the box....but we'll see. SOOOOooooo..... I have recently discovered that I can add pay pal to my blog so I am now offering squash books for sale at 19.95 each. You can purchase this one while supplies last of course since the paper is retiring the 30th or I can make a custom one. I added some different papers in the drop down menu that you can choose from. If you prefer something else, You will have to let me know which papers you would like and I will give you an estimated shipping time as I may have to order paper. You can browse through the current catalogs on the right to find some papers that are available. If you prefer a specific holiday or occassion and we dont have paper that you think fits, let me know and I can see what I can do. Each book will come with a coordinating box to put it in. I can make a title for the cover or decorate it for whatever theme you would want if you let me know ahead of time. Well thanks for stopping by! Hope everyone has a wonderful day! So its that time again....time for our monthly downline meeting with my wonderful upline Angie and my sideline Melody and this is my swap card. If you think you might be interested in becoming a demo just email me and you can join us at our meeting to see what its all about. We can answer any questions you might have and join in on the fun!! Back to the card......when I started making the card I really had no idea where I was going with it or what I wanted to do. So I started with some colors. I thought I would try some Groovy Guava since I never use it and its going to be retiring soon (Contact me to order your paper before its too late). So then I opened up one of my drawers to find some more paper and on top was this sage shadow. Ive always like the color, but again, never use it. I thought they went very well together. So now I just needed one more color to off set it. I found my barely banana in the drawer with the sage shadow....I had just enough. So then I was thinking of what stamp I could use and I love this set! Its just so cute so I opted for the big butterfly from it... then it all just kind of came together. I used the whimsy wheel on the groovy guava and stamped the butterfly in sage shadow ink. I then used my 2way glue pen and added dazzling diamonds glitter. I dyed some whisper white ribbon with my sage shadow ink because I didnt have any ribbon on hand to match and added some brads at that bottom. I used my ticket corenr punch on the butterfly layers and thats it... it was a quick and cute card to put together. In the end I am very pleased with how it came out. Thanks for stoppin by and checkin out my blog! Hope everyone has a great day! My son Wesly has autism and today is the last day he will see 3 of his 4 teachers as he turns 3 tomorrow. As a gift, I made each of them these bags and a card. I found a saying for teachers somewhere online at one point that listed different items and what each stood for. So I bought all of the items on the list, put them in the bag, and included the saying inside of the card so they didnt think I was crazy and just throwing a bunch of random items in the bags. It was my first time ever making these bags and they actually turned out to be quite simple. I got the idea from Shestampshestamps over at SCS. To make the bags all you do is take an 8 1/2 by 10 piece of paper score it at 6 and 8 (on the 8 1/2 inch side) then cut the paper in half at 5inches. now you should have two identical pieces of paper which will be come your 4 sides. For the bottom you need a 3x7 piece of paper. You then score all the way around it at 1/2 inch. Where the scores meet at each corner, you cut through the center (where it makes an x). Then you fold up the sides. I used the red sticky tape from SU and put it on all sides of the 3x7 piece. On your two larger pieces, I put sticky strip on the smallest fold...its a 1/2 inch. Then I just taped it all together. For the handles you need a 3/4 by 11 strip of paper. I then just used brads to attatch them... I also put a small piece of sticky strip at the bottom to help support and keep the hanle ends straight. Hope those instructions were clear for ya. I used Berry Bliss DSP for all of the bags. I used either purely pomengranite or Close to Cocoa for the bottoms. For the Card I used Chocolate chip for the base, Purely Pomengranite for the mat behind the Berry Bliss DSP. I used Pretty in Pink and my scallop punch for the scalloped circle. Then I stamped the butterfly from Priceless in Purely Pomengranite and punched it out with the 1 3/8 circle punch. I popped the scallop up on dimensionals, added the so kind in white craft ink and I was done! Very simple card. I hope they like them. It's not very much, but how do you thank someone that has helped your son become a new person? For our monthly downline meetings we have a card swap and we participate in Stampin' UP's monthly contests. June's contest was to create a card using fall colors. This is my card! I used chocolate chip, Ruby Red (though you cant really tell the true color from the pic) and whipser white. I used the Lovely as a Tree stamp and the Much Appreciate set for the the "Thanks". I colored in the tree with my pastels. Although you cant see it in the picture, I colored the background of the tree blue and green...for the sky and grass. I also used one of the small leaf stamps in the set and stamped it on the ruby red as a background. I finished it off with a piece of chocolate chip taffeta ribbon and thats it! Its a pretty simple card, but I really like it... it looks much better in person.. So I got my hands on a sample of the new decor elements! This is just a sample of what we will be carrying in a couple months. 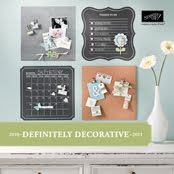 You are able to order the new decor elements starting July 1st! How exciting!! New Decor Elements Hope you all have a great day! The time has come... out with the old and in with the new! The Stampin Up retirement list is out and although we may be losing some wonderful sets we need to make room for some new ones. Make sure you check out the list below to see whats retiring and get me your order before its too late and they're gone for good! Also dont forget the Occassions mini ends June 30th so make sure you get those sets before those ones are gone for good too! Dont have a copy, check out my link on the right. It will bring you right to the book. Now I know its a sad thing to lose so many wonderful sets so I thought Id save the best news for last! 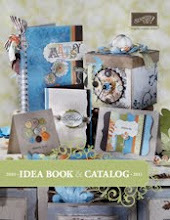 Stampin' Up announced that we will be getting a new product line today. Think you can guess what it is? Well..... Ill tell you... Stampin Up is now selling vinyl wall rub-ons! How exciting!! and the great thing about them is ANYONE can use them...whether you rent or own your own home. You can peel the vinyl off if you decide you dont want it anymore! Isnt that Fabulous!? I would love to show you samples, but I havent actually seen any yet...but as soon as I get my hands on some I will definately share them with you!